An engaging, thought provoking and culturally respectful website delivering multi-layered interpretation and education through videos, historic artworks and extensive research including links to primary sources. Heritage interpretation projects always come with a layer of sensitivity. These projects are very close to people’s hearts and, in the case of the Finding Bennelong website, to the cultural identity of the Indigenous community. What’s been really effective has been the guidance we’ve had from Art of Multimedia in marrying together the content and the technical capacity and managing that project with professionalism that goes above and beyond. A project like this is not just taking content and building a website around it – it is about establishing a process of consultation, examining extensive research, engaging stakeholders and the community, and then interpreting your findings to present an outcome all contributors are proud of. Art of Multimedia led a team, which included Archaeological Heritage and Management Solutions and 3D Projects who brought additional Indigenous consultation, heritage and interpretive storytelling expertise. The website uses a series of 15 videos which chronologically and thematically interpret the story of Bennelong, to make the journey of his life accessible to all ages. There is much debate about the character of the man and through these videos, based upon the significant research of Historian Keith Vincent-Smith and drawing upon historic artwork, additional research, references and links to primary sources, the website visitor is able to draw their own conclusions. We also created some off-line, printed promotional material for Ryde City Council to create awareness of the project. 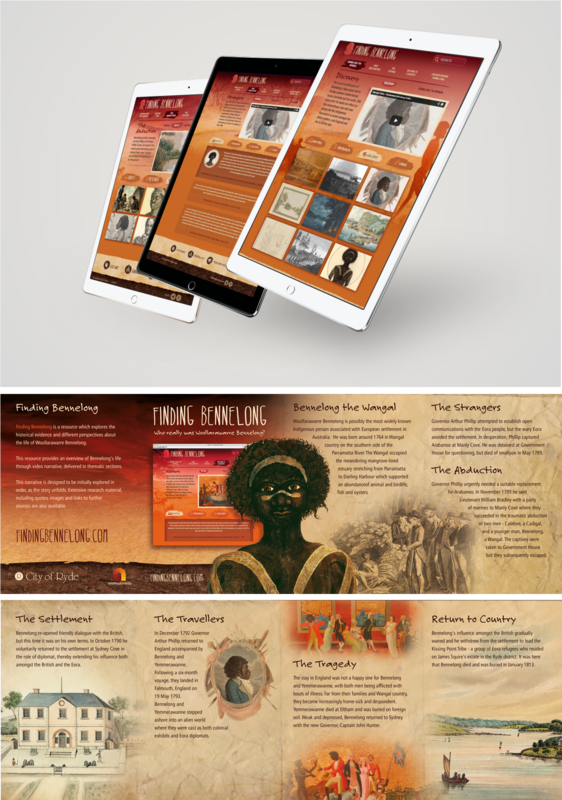 The final result is a polished, contemporary and engaging resource that we hope will prompt students and everyone who visits the website to form their own perspective of the legacy of Bennelong and consider the impact one individual can have on their world. Visit Finding Bennelong – we’d love to know what you think. Interested to hear from the project contributors?